THE OWNER OF the shop which sold the latest winning Euromillions ticket has said he is thrilled by the news. 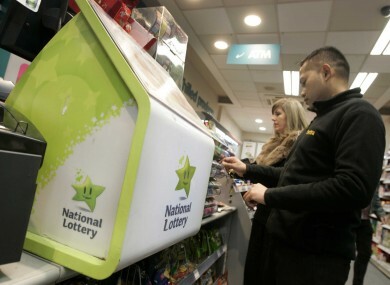 The National Lottery said the winner – or winners – of the €29 million jackpot has decided not to go public for now. However, today it confirmed the quick pick ticket had been bought at the Garryduff XL Store, of Pound Road, Castlebar in Co Mayo. This is the second time a Euromillions jackpot ticket has been sold in Castlebar. Umesh Kumar, owner of the store that sold the golden ticket, said he could not believe it when he was contacted by the National Lottery. Kumar said he believes this win will put his store “on the map”. The National Lottery was contacted by the holder of the winning ticket yesterday, but it is not yet known when they will come to claim their prize. They have 90s days to do so. “This is very exciting news, but it is important that the winner is given the time and space to make arrangements and to let the news sink in,” said chief executive Dermot Griffin. He said there is a case of “the luck of the Irish” when it comes to the Euromillions. Email “'It will put us on the map': Castlebar shop owner thrilled at selling winning Euromillions ticket”. Feedback on “'It will put us on the map': Castlebar shop owner thrilled at selling winning Euromillions ticket”.